Supply light and air flow to a truck trailer or work area on a double-strut arm to help improve worker comfort and visibility without having multiple mount footprints. The LED light module boasts a 5 year warranty, a life expectancy of over 60,000 hours in typical applications and is protected by a heavy-duty cast aluminum lamp head with a shatterproof polycarbonate lens that is dustproof, withstands water spray and is field repairable for less down time in the event of an accidental breakage. A low vibration, three speed fan with an 18" blade diameter provides adjustable air flow rates up to 3,190 c.f.m. to help keep workers cool in the summer and decrease thermal stratification in the winter. 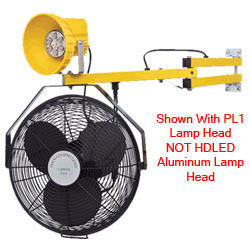 Adjust the 40" double-strut arm at two different horizontal rotation points to position the fan and light in the direction desired, then fold it back against the wall out of the way while not in use.